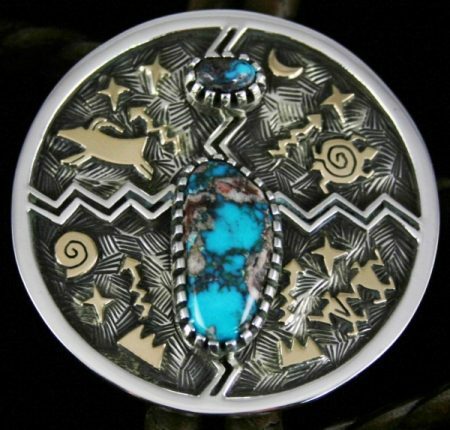 Arland Ben invented the use of small 14K or 18K gold petroglyph images overlaid on sterling silver to create unique and visually stunning jewelry. He also works in only gold. 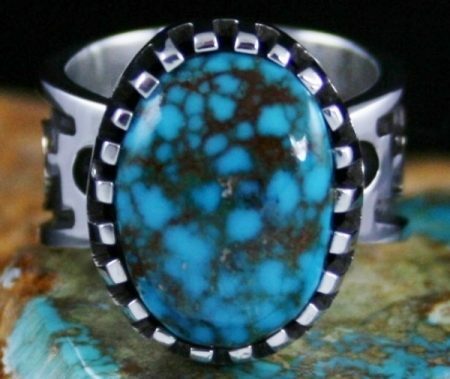 Arland uses the highest grade natural turquoise to be found in this country. 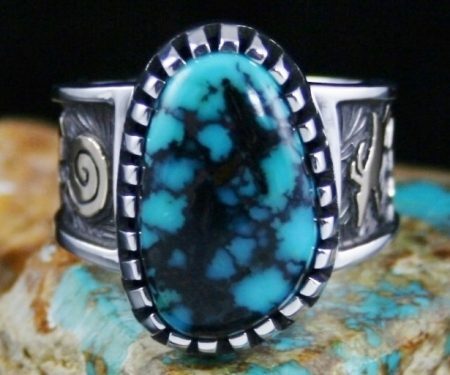 We have been trading with Arland since the early 1990s, supplying him with much of the gem grade turquoise he uses in his complex and beautiful work. 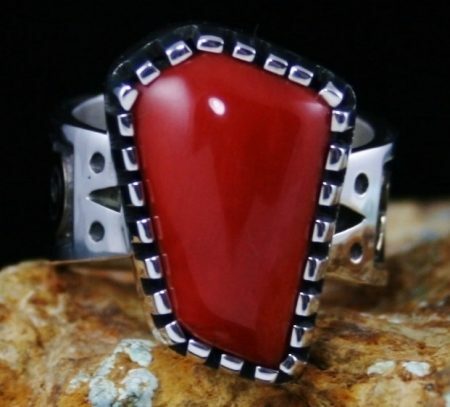 Arland has won first in Santa Fe Indian Market and is considered one of the finest and most collectible artists of today. 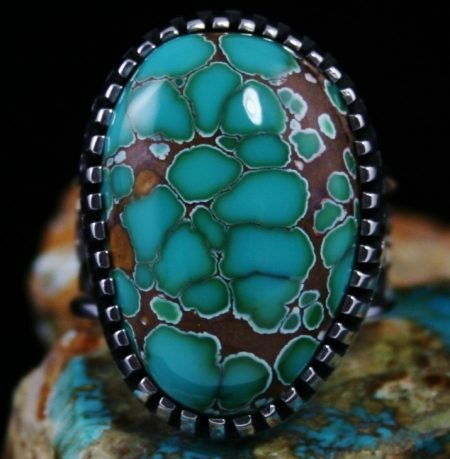 This extraordinary bolo features two incredibly gorgeous gem grade natural Bisbee turquoise cabochons as the focal point of the piece. The cabochons are deep Bisbee blue with vibrant purple and reddish-brown matrix signature to the mine and are enclosed in Arland's distinctive hand chiseled bezels. They sit as sentinels in a perfectly round bolo back. Surrounding them are solid fourteen karat gold petroglyphs made entirely by hand and overlaid in four sections. 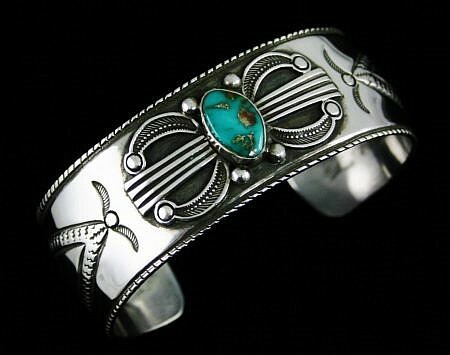 A deer, stars, moon, lightning, turtle, mountains and migration symbols cause the bolo to shimmer when worn. Exceptional keepers and tips each with petroglyph figures finish the piece attached to a unique hand woven cord. This creative bolo is a beautiful expression of a master goldsmith at the epitome of his career. 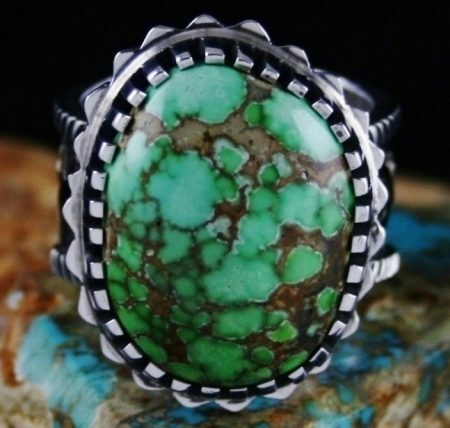 Gem grade red spiderweb Candelaria turquoise quickly vanished when small amounts were found several years ago in north central Nevada. Today only a few hoarded examples emerge from time to time. This exquisite specimen exhibits a three dimensional deep Candelaria blue hue with complex red webbing. Arland has set the cabochon in a unique hand chiseled bezel, signature to the jeweler, above a beautifully tapered shank. 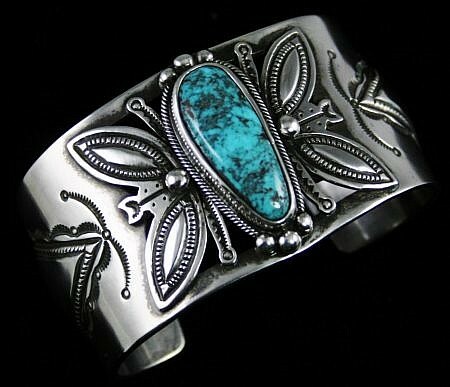 The band is entirely etched, oxidized and adorned with solid 14 karat gold petroglyphs hand cut and individually overlaid by the artist. The finished ring is exceptional and super collectible. 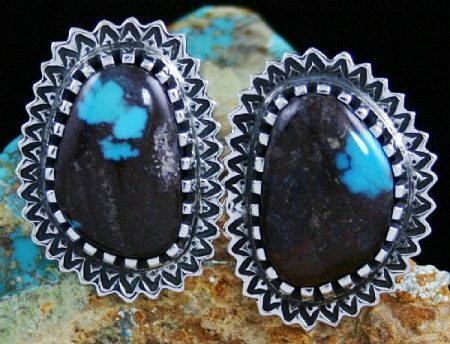 Navajo jeweler Arland Ben has selected two exceptional gem grade natural Bisbee turquoise cabochons to create these fine earrings. The gems each exhibit marvelous bright blue hues against a large smokey purple host rock back ground classic to this depleted mine. They shimmer with high quality. Arland has set them in a complex and intricate sunburst design that is hand cut and deeply stamped in a unique fashion. 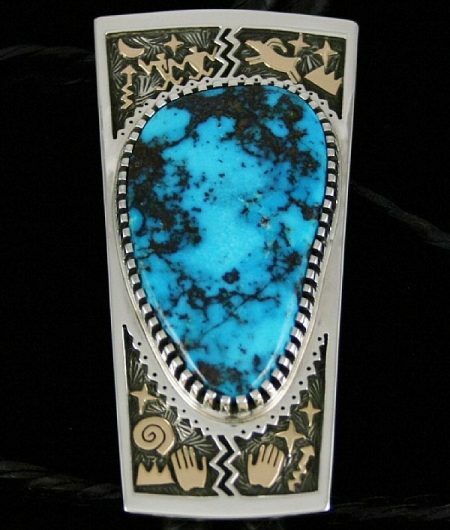 The artist's signature bezel work encircles each stone and is the perfect compliment to the rarity of the turquoise. The earrings are highly collectible, lovely and eye-catching on the ear. 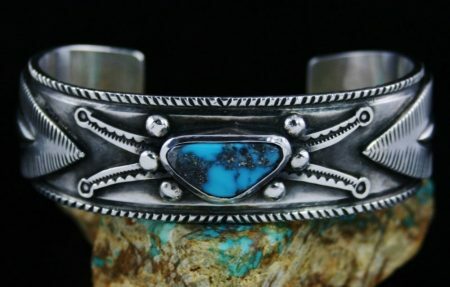 Without a doubt, this is one of Navajo jeweler Arland Ben's greatest and most beautiful bolos. At the top of the bolo are solid 14 karat gold shooting stars, a crescent moon and a man and woman holding hands next to a sterling lightning bolt that separates an elk figure, two stars and the mountains. 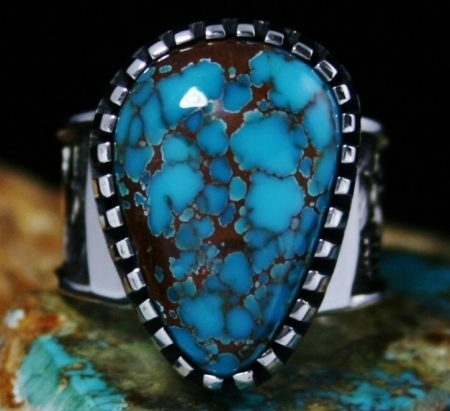 Beneath is a massive 98 carat gem grade natural Candelaria turquoise cabochon. The blue of the gem is electric with flexes of deep black and reddish-brown spiderweb wispy matrix. This is the gem grade and is virtually unknown in this size today. Candelaria of this quality ranks with the finest mined in the Southwest. Below the gem on one side is a golden star, wind in a swirl, mountains and hand for healing. Separating the symbols is a second sterling lightning bolt with a hand for friendship, two stars and shooting star design on the right. Overlaid on the sliders is a 14 karat gold hands of man on one and a swirl of wind on the other. The fine tips feature a golden mountain, wind swirl, and two stars. On the other is a mirrored mountain, a hand, crescent moon and star. This stunning bolo features a fine hand made black woven bolo cord as well. 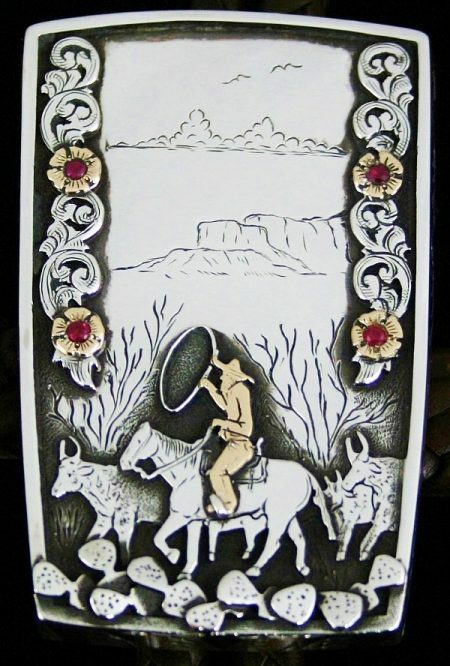 This is Arland Ben's great masterpiece "ode to the cowboy". As if he aspired to be a painter in gold and sterling silver, Arland places a string of engraved flowers and vines on each side of the bolo. Two of the flowers on each side are solid 14 karat gold with natural rubies set flush. Framed between are the mountains with birds above. Next to the mountains is the chasm. Rising below are the mesas. Riding through this paradise is the bearded cowboy twirling his lasso. A golden figure in the desert chases four cattle amongst the mesquite and the cactus. On the sliders sit two gold shooting stars with bright red rubies in each. Below the sliders are superlative tips, each with a gold cross and spur that rotates. This is one of a kind. 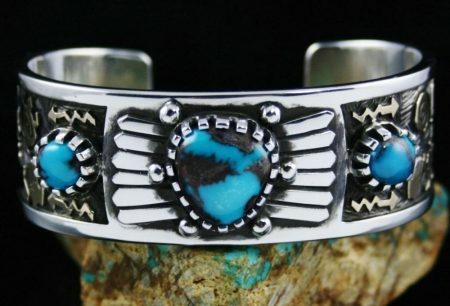 Western folk art at its finest! Arland at the peak of his creative brilliance.